Photograph of SCP-3071 before containment perimeter was established. Special Containment Procedures: A 3m tall chain-link fence topped with barbed wire has been constructed around the perimeter of SCP-3071, and is to be guarded by no fewer than three security personnel posing as construction workers. Rotation of SCP-3071's security personnel is to take place every 3 weeks, or immediately if one or more security personnel are exposed to SCP-3071's effect. Any civilians attempting to breach containment and access SCP-3071 are to be amnesticised and relocated. All individuals affected by SCP-3071 are to be transferred to Site-108 for extensive research. 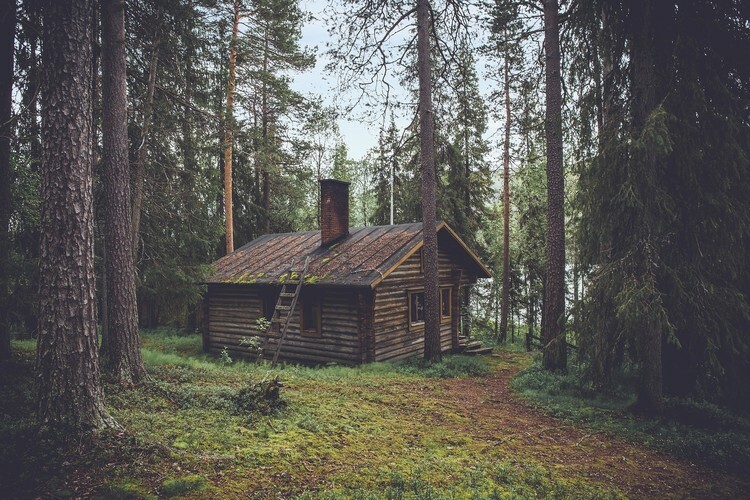 Description: SCP-3071 is a single-story log cabin, located in a dense forest area in [REDACTED]. All possible entrances to the cabin have been boarded up from the inside, making it impossible to view the interior of the cabin. Attempts to forcefully gain entrance to SCP-3071 through the door, windows, and chimney have failed. Individuals approaching SCP-3071 are affected once they are within a range of two metres. Upon entering SCP-3071's area of effect, that individual undergoes a gradual neurological alteration over the course of approximately one month. This effect is irreversible, and moving out of range of SCP-3071 does not cease this alteration. During this time, the individual slowly loses conscious control of their body, losing the ability to move limbs and eyes, speak, or move facial muscles, eventually rendering the individual completely paralysed. As well as this, the individual begins to gradually lose function of all sensory inputs. However, unconscious control, such as organ function, will not cease during or after this time. After one month, the affected individual is rendered completely immobile and unresponsive to any outside stimuli. However, electroencephalograms2 have shown that affected individuals fully retain consciousness. Affected individuals will expire from starvation unless provided sustenance by outside assistance. Extensive attempts to regain limb function and cognitive senses in affected individuals have failed. History: The cabin was constructed in 1977 by a man named ████ █████, who was reported missing in 1990. The time frame between ████ █████'s disappearance and the earliest recorded appearance of SCP-3071's effect can pinpoint the emergence of SCP-3071's anomalous properties3 between 1990 and 1994. Investigation of the exterior of the cabin and the surrounding area has provided no evidence as to the cause of ████ █████'s disappearance, and resulted in █ casualties. Addendum 3071-2A: On 05/01/20██, security personnel reported a cloaked individual exiting SCP-3071, pushing a sealed envelope4 through the fence. The individual then retreated into SCP-3071 before the individual could be detained by security personnel. A week after this report, all three security personnel reported gradual decline of motor functions. Further investigation revealed the extension of SCP-3071's area of effect5, resulting in the loss of 3 security personnel and 2 researchers. The perimeter of SCP-3071 has been vastly extended under the guise of an agricultural development project. All surviving staff have been evacuated and submitted for physical and mental evaluation. It is my dearest request that you do not interfere with our work. We have quite a day ahead of us. The Beast is upon you. Addendum 3071-2B: On 16/02/20██, a tall humanoid entity with luminous white eyeballs and antlers similar to that of a Cervus elaphus (red deer) emerged from SCP-3071, and breached containment, evading security personnel through unknown means. The entity (now referred to as SCP-3071-1) reportedly approached Dr. Alexander Raedon, the head researcher of the SCP-3071 project, and conversed for several minutes before attempting to assault Dr. Raedon. Security personnel opened fire on SCP-3071-1, wounding SCP-3071-1 as it fled into the surrounding woods. While the body of SCP-3071-1 was never recovered, SCP-3071 no longer retained its anomalous properties, and was classified Neutralized on 19/02/20██. 2. EEG scans, used to record brain wave patterns. 3. The cause and source of SCP-3071's anomalous effect is currently unknown. 4. Analysis of the envelope dated it back to 1989, originating from the Soviet Union. 5. The area of effect extended from 2m to 15m.